The Economist recently covered the relationships among climate change, agriculture, and big data in "Digital disruption on the farm." 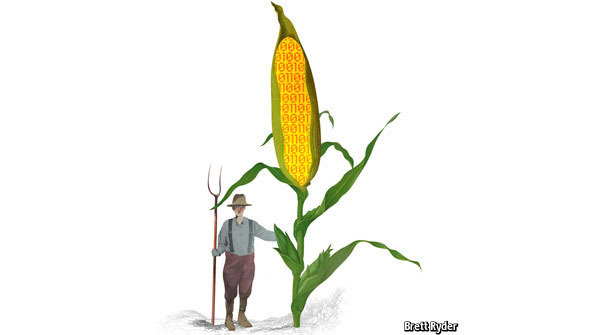 Big data--a catch term for examining the massive, available, digital data sets for emergent relationships--stands to help and change agriculture. Agriculture, with long-term records on soils, yields and land prices, in combination with weather records is the focus of some big data pursuits. For example, in October 2013, Monsanto purchased a startup company which had aggregated data for all 25 million fields in America to the tune of $1 billion dollars. The benefits to producers are higher yields. But this comes at the cost of privacy and perhaps competitive advantage. Still, the biggest names in corporate agriculture teamed with spatial information companies (John Deere/DuPont Pioneer; Land O’Lakes/Geosys; Monsanto/Climate Corporation) are collecting data, preparing products, and some are already marketing their big data products for prescriptive planting and precision agriculture on the large scale. Around the Web is REACCH's blog about timely news articles covering agriculture and climate change interests for our stakeholders.